After two years of extensive discussions and continuous improvements, BIMCO relaunched the Shipping KPIs benchmarking tool on the 26th of February. 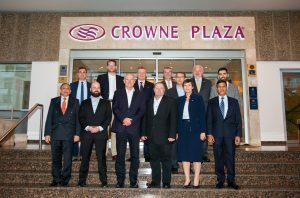 The relaunch event was hosted at Crowne Plaza hotel in Limassol, Cyprus and was attended by a good number of industry representatives from the entire maritime spectrum. SOFTimpact, as the authorized company for the development, support and security of the Shipping KPI system has proudly participated in the event and had the great opportunity to speak with maritime professionals about the benefits of the tool. Shipping KPIs as a community tool made by the industry for the industry, designed for shipowners and ship managers, to make rational strategic decisions on how to improve the performance of their fleet, by bench-marking with other ships in the segments they operate in. SOFTimpact Ltd. is a leading Maritime IT solutions provider based in Cyprus for over 19 years. The company specializes in products like Payroll, Crewing, KPI and Cybersecurity for Maritime and works with associations such as BIMCO, Intermanager and the Nautical Institute.